Dolphins are truly remarkable animals. 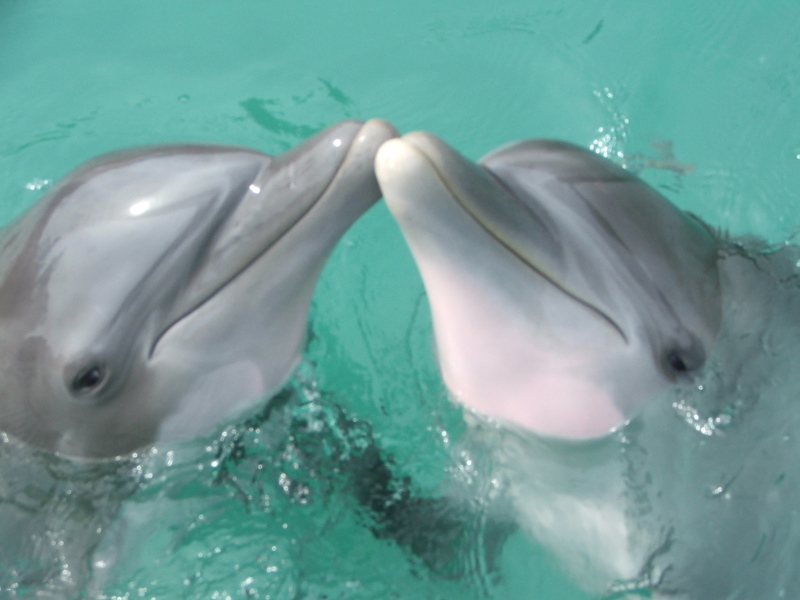 Early cultures so highly regarded dolphins that they featured them in their mythology and artwork. The ancient Greeks, for instance, often depicted Poseidon and Aphrodite accompanied by dolphins, and Indigenous peoples in Brazil have long venerated the Amazon river dolphin as sacred, considering it bad luck to kill or eat one. Scientists believe dolphins are the second most intelligent beings on Earth (after humans) and have argued that they should be treated as nonhuman persons. In some ways, we’ve loved these animals to death. We want to be close to them – so close that we’ve learned how to capture dolphins through violent hunts in places like Taiji, keep them in tiny tanks, breed them, and “train” them to perform tricks for our amusement. The gentle curve of their mouths give them the appearance of always smiling, even as they are suffering at human hands. 1. Protect the oceans. Dolphins live there, after all. We can start by not consuming marine life and minimizing our individual use of plastic, which often ends up in the ocean. 3. Speak out against the Taiji dolphin hunts. The notorious annual dolphin hunts take place near Taiji, Japan, from about September 1 until at least March. Every year, fishermen locate pods of migrating dolphins out at sea and herd them into Hatagiri Bay with boats, nets, and long metal rods that crew members dip below the surface and pound to create an acoustical wall that disorients the dolphins’ sonar. The fishermen leave the animals overnight in a narrow cove and return at dawn armed with the knives and spears that will gradually turn the blue tide scarlet. While many dolphins are killed for meat, others are sold to zoos and marine parks worldwide, making the drives an incredibly lucrative business. Contact authorities in Taiji, as well as the Japanese Embassy, US Embassy to Japan, US and Japanese Ambassadors to the UN, and the US Senate members of the Committee on Foreign Relations. Call or send them a polite message expressing your feelings about the dolphin hunts and ask them to do everything in their power to help put an end to the misery. 4. Join volunteers in Taiji. You can also volunteer with Sea Shepherd or The Dolphin Project on site in Taiji. Those who are interested in volunteering as a Sea Shepherd Cove Guardian should email groundcrew@seashepherd.org. (Please note that volunteer applicants must be able to commit to participating in the campaign for a minimum of one week.) To sign up to join Ric O’Barry and his Dolphin Project team as a Project Cove Monitor, please click here. 5. Contact travel companies and travel agents. It was great news when Thomas Cook and TripAdvisor recently stopped offering or promoting travel to attractions that exploit dolphins and other animals. But plenty of travel companies and travel agents still feature attractions and hotels that keep cetaceans in captivity. When you see a company promoting dolphin captivity, ask them to reconsider. If they don’t respond, send an email to coveguardians@seashepherduk.org. 6. Support groups working on behalf of dolphins. Such groups include The Dolphin Project, Sea Shepherd, and Blue Voice. 7. Know how to respond if you find a live dolphin stranded on the beach. Click here. Oh, and if you’re looking for a truly dolphin-safe can of tuna, try this one – or make a great-tasting tuna-like salad using chickpeas! Please share this post with family and friends and ask them to get involved.